This dock doesn't make any noise when plug in and allows perfect access to your iWatch for the nightstand mode. The 3 charging ports give you the ability to charge all your bed side tech from one power source. There is a stand piece for your watch to sit on and not just hang on a arm like some other charges. The position your watch charges in allows you use the alarm clock feature on your watch very easily. You deserve the convenience when traveling of being able to plug your iPad, telephone and camera or some other devices in one location and have your watch charging at the same time all while using only one wall outlet. Made of high quality premium Aluminum, makes it best companion for your noble iWatch. Light Weight & Sturdy with built in Anti-slip base mat, super convenient and suitable for traveling and daily use. 18-month worry free warranty. We intend to offer you a 100% satisfying purchase experience from Oittm. Please contact us first if there is any problem with the item. We will try our best to give you a satisfying solution. [The Oittm Advantage] 3 in 1 replaceable bracket for apple watch, iphone and fitbit blaze, fully considered user's needs. 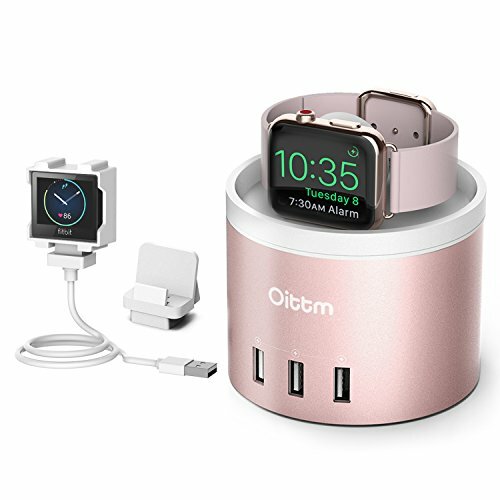 [4 Ports Mutilfutional Rechargeable Stand] One inside USB port for the Apple Watch and three outside USB ports for other devices, supporting charging of all Apple Watch models & three USB 2.0 and 3.0 devices simultaneously (iPhone 8/8 Plus/X/10, iPad Pro, Samsung S7/Edge included). [Cable Storable] The inside space not only holds the apple watch charging cord, but also can store other little gadgets like USB adapters, card readers, etc, it helps you to coil the watch charging cable in a neat appearance without kinking the cable while charging, making your nightstand neat and manageable. Made of premium Aluminum. [Smart IQ Charging Technology] Power IQ and Voltage Boost combine to charge up to 5V/2.4A Max per port for a total of 6 Amps, and each port can automatically detect your device. This is the best charging companion for your Apple watch, iPhones and other USB devices. [Nightstand Mode] The stylish flat deck design allows the nightstand mode for your apple watch while charging with the Oittm Stand. You can take full advantage of your iwatch even when it is charging. [ATTENTION] APPLE WATCH MAGNETIC CHARGING CABLE AND OTHER DEVICE USB CABLES ARE NOT INCLUDED. Lifetime Warranty. If you have any questions about this product by Oittm, contact us by completing and submitting the form below. If you are looking for a specif part number, please include it with your message.